The old Igbo saying that if a child washes his hand clean he dines with his elders, was the epitome of what played in Port Harcourt, the capital of Rivers State on Saturday, August 8 2009, as Chief Obiaruko Christie Ndukwe (popularly called Oby Ndukwe) the publisher of Beam newspapers, a Port Harcourt based newspaper, was honoured by Rotary International District 9140, at L.A. Kings Resort in Port Harcourt, with many other dignitaries in attendance. She had won overtly many awards. Wreathing in smiles, Oby who is also a staunch supporter of Rt. Hon. Chibuike Amaechi, the Executive Governor of Rivers State, is also the Media Consultant to the Governor. Not only a journalist and a publisher, Oby had been a voice to reckon with as far as Nigerian politics is concerned, especially that of Rivers State. She has stood politically by Amaechi through thick and thin. On the recent allegation of graft against Amaechi by a group that calls itself Niger Delta Citizens and Budget Platform, Oby made the point clear: Well, even if we have to look at the allegations made, first and foremost, it is not just possible for the governor to stash away such funds because merely looking at what he is doing and what he has been doing since he came into office less than two years and the mega projects he has embarked upon, you can tell that there is no way he will have that kind of money to stash away and still be able to do the things he has been able to do. The issue, like I argued, is the group should be in a position to tell us how much the governor has received since inception before telling us how much he has stashed away so that the reading public will now probably judge to see whether it is possible for somebody, having received less than that amount of money since coming into office in October, 2007. According to a source, Oby didn't lobby for the award as wont by many in her class in Nigeria; it was given to her by her outstanding philanthropism. She is a woman who commands respect and wields much power with dignity and is ready to put her head in the area where truth is the fad of the day. She says of Amaechi that he is the best thing that has happened to Nigeria, in Rivers State. She observed on the allegation: It is not even about how much Amaechi received from October 2007 till date. It is how much he received prior to the Ghana elections? And we all know when Ghana had their election so, it is easy. It is a public document for anyone to confirm, as long as you know elections are statutory, and I can tell you that what he has received falls far short of whatever amount they are talking about. For me, the allegations leveled against the governor by this faceless group are mere fabrication to smear his character. This is the handiwork of the people who were hell bent on stopping him from being the Governor of Rivers State right from the PDP primaries, and so it was all planned. You will recall that then they said the EFCC was after him for money stolen as the speaker. Till today, those allegations have not been substantiated. So, you can see that it is still the same pattern. It is long expected and I can assure you it will not stop. Oby says that on the area of education, Governor Amaechi is building over 250 primary schools and some other schools. From what he is doing, she's sure, some of those in the business of private schools will run out of business very soon because confidence is going to be restored in the public schools. She has always addressed people that Amaechi is building infrastructures to make them comfortable. The teachers are going to be trained and retrained, good teachers who have degrees. Even the curriculum they are going to use will be such that can compete with any private school in any part of the world. No straighter answer can be given to who Oby is than she is a mover. Oby was in March this year reported to be preferred to the long-serving Isikima Harry, Publisher of The Mirror newspaper, for the headship of the Rivers State Independent Publishers Association (RIVPA), a report many rebuffed and gave their unflinching vote of confidence to Harry. Incensed in particular by a report on page two of TOPNEWS of March 11, 2009 captioned Oby Ndukwe now RIVPA chairman in which, according to reports, the reporter mischievously alleged that Isikima Harry (JP) has pledged to work with the imaginary Oby Ndukwe-led exco, members of the body stated unequivocally that they remain committed to the leadership of RIVPA under Isikima Harry. Not only did publishers sideline that information, RIVPA Exco condemned it as falsehood and misleading information being dished out in TOPNEWS. Oby was alleged heads the pro-government political group called the Rivers Success Movement, and was alleged that she thinks that by hijacking RIVPA she can cage independent publishers whose primary duty is to the larger society and not to the government in power. But Oby is more than being rubbished. Apart from being a publisher and a philanthropist, she is a peacemaker given by her antecedents and transparent points she has been making in the Amaechi-led government Rivers State, no matter what the nineteen-member emergency congress of RIVPA was reported to also have stated that those behind what they called mutiny are self-serving and do not enjoy the support of the majority of RIVPA members as their action is not in line with due process or the association's constitution. Did they say that it was in their desperation to give credibility to their unconstitutional action that they shamelessly lied in the TOPNEWS report that Harry had pledged to work with the new executive, and urged the generality of RIVPA members and the public to ignore the claim? And why was it that while viewing allegations against Harry as claimed to be unfounded, baseless and calculated to divert attention from the alleged criminal activities of those behind the attempt to blackmail him, the congress allowed Harry to direct the Disciplinary Committee of RIVPA to investigate the role of these persons in misappropriating association, property, and make necessary recommendations for possible sanctions, instead of forming a panel of inquiry? However, Oby had been fighting for the good of Rivers people and the state government and any statement saying that she was trying to balkanize RIVPA, was a cheek-in-tongue statement. Rotary International District 9140, Nigeria saw the selfless potentials in Oby that she graced the organization's award last Saturday August 8, 2009 at L.A. Kings Resort in Port Harcourt, for having transformed and touched lives of many (especially the needy) in the society. Let all and sundry wish her more years for the task ahead and may her wisdom in achieving all these never wane. 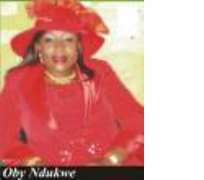 Chief Oby Ndukwe is long over due to head a ministry in Nigeria.